A website isn’t complete without visitors! Our team incorporates search engine optimization (SEO) best practices at every step of design and development to make sure that your website will be seen by search engines. By building the site with a structure that search engines can find and understand, we help ensure that potential customers easily find you online. 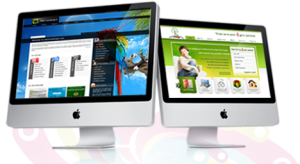 Responsive websites provide the best user experience across devices. Every website we design will be responsive for optimal viewing on your desktop, phone, or tablet. To ensure a seamless experience, our quality assurance team will test your website across multiple devices and browser types before launch. Instead of launching your website and hoping for the best, we launch our sites quickly and then use your real user data to inform improvements. We’ll look at data from Google Analytics, your CRM, and other systems to guide us toward continual improvements that will increase website conversions and ROI. We know that you need to protect both your business resources and customers’ personal information. That’s why Aptera applies a proactive and robust content security policy to every website. This policy was developed to avoid script vulnerabilities, monitor for weak authentication and session management, and much more. Our team understands the risks of sensitive data exposure and even has experience providing HIPAA compliant services. In most cases the main reason for not having a website is cost. Many musicians do not have the money to invest in a website.